With a renewed image on one of the best beaches in Ixtapa, this modern tower is angled to have spectacular views to the ocean featuring 255 rooms with balconies that have a partial or total view to the sea. Located across the street from a prime shopping area and just a few steps away from the Golf Course, the hotel features 6 restaurants and bars, among them the famous Bogart's, a favorite in Ixtapa. Located in the heart of El Palmar beach in the hotel zone of Ixtapa, within walking distance from shopping areas and La Marina area, 20 minutes from airport, and 3 minutes from the golf course. Bogart's, Aquamarina, Las Velas, Snack Bar La Cascada, Sports Bar, Christine Club (Night Club) and In-Room Dining. 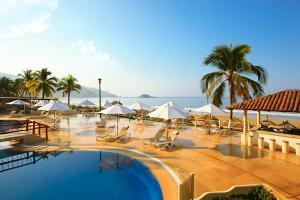 Marina Area, Zihuatanejo downtown, Shopping, Golf, and Deep Sea Fishing.